UPDATE: Making history, Democrat William Tong narrowly defeated Republican Sue Hatfield to become the state’s next attorney general. In doing so Tong became the first Asian American constitutional officer in Connecticut and the second elected Asian American attorney general in the United States, his campaign said. Hatfield conceded late Wednesday morning. The race was the most closest of any of the underticket contests, all of which were won by Democrats. Secretary of the State Denise Merill was re-elected to a third term, as was state comptroller Kevin Lembo. Democrat Shawn Wooden won the race for state treasurer. The attorney general’s race was an unusually tight contest that pitted Democrat William Tong, one of President Donald Trump’s staunchest critics, against one of Trump’s vocal supporters, Republican Sue Hatfield. Tong has been the state representative for Stamford and Darien for six terms and chaired the General Assembly’s Judiciary Committee. Tong is also a commercial litigator at Finn, Dixon and Herling in Stamford. Hatfield is a state prosecutor from Pomfret, with a master’s of law in taxation. She has also worked as a registered nurse. This was her first run for office. “We worked hard, and made many friend along the way, but we fell just short,” Hatfield said in a statement on Facebook Wednesday morning. Like the governor’s race, Hatfield and Tong have linked each other to deeply polarizing figures, Trump and unpopular Gov. Dannel P. Malloy. Tong has vowed to be a “firewall” against Trump’s policies, whereas Hatfield is a loyal supporter of the president. Hatfield pointed out that Tong was endorsed by Malloy when Tong ran for Stamford mayor in 2013. Tong and Malloy have worked closely in the legislature. The Connecticut attorney general, a post now held by Democrat George Jepsen, is the state’s top civil litigator. The secretary of the State and comptroller races were the only two statewide offices that had incumbents seeking re-election. Secretary of the State Merrill defeated Republican Sue Chapman. Merrill has been secretary of the State since 2011 and served as president of the National Association of Secretaries of State in 2016 and 2017. Chapman is the former first selectman of New Fairfield. 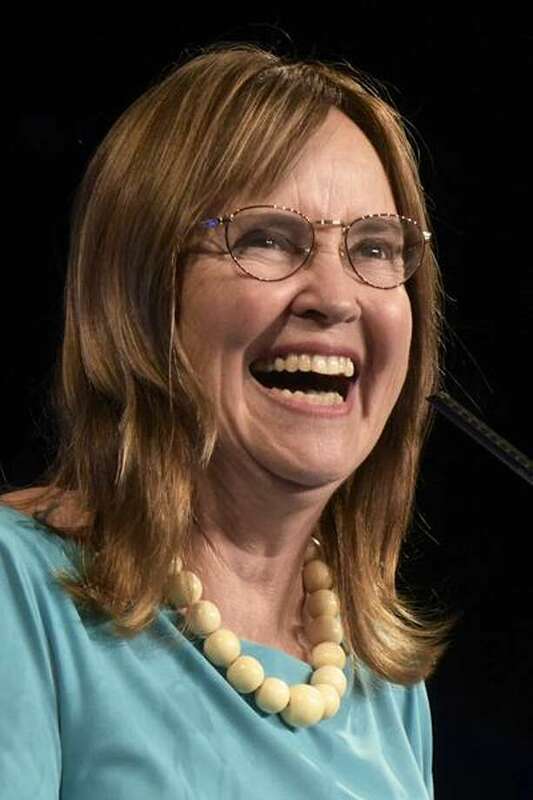 “Thank you to the voters of Connecticut for trusting me with the honor of serving as your secretary of the State,” said Merrill in a statement Wednesydat morning. In the comptroller’s race, Lembo won over Republican Kurt Miller. Lembo, who became comptroller in 2011, is the first openly gay statewide official elected in Connecticut and spent decades working as a public health advocate. Miller, the first selectman of Seymour, has attacked Lembo as a “rubberstamp” for Malloy. Fighting for the treasurer’s office — an open seat for the first time in 20 years — Democrat Shawn Wooden triumphed over Republican Thad Gray. Wooden had been shown trailing by 20 points in a poll as recently as Friday. “It was very special standing here tonight with this victory,” said Wooden, referring to Dunkin’ Donuts Park in Hartford, a place that became a flash point on the campaign trail between Wooden and Gray, as Gray criticized Wooden for championing the $72 million project at a time when the city was broke. Wooden, a former Hartford city council president, is an attorney for Day Pitney who assists public pension funds with investments and securities law. Prior to a recent retirement, Gray was chief investment officer for Abbott Capital Management, which oversees private equity investments on behalf of public pension funds. Gray lives in Salisbury. Each candidate claims they have the right experience to properly run the treasurer’s office, even if they largely agree when it comes to the state’s massive pension debt and growing reliance on borrowing. Denise Nappier, state treasurer since 1999, is the first African-American woman elected to serve as a State Treasurer in the United States and the first African-American woman elected to a statewide office in Connecticut. All the underticket candidates spent time campaigning with the top of their ticket in the run up to Tuesday’s election. For Democrats, that was Ned Lamont, a Greenwich cable entrepreneur. For Republicans, it meant time on the trail with Republican Bob Stefanowski, a former UBS and payday loan company executive.